The teen years are a tumultuous time for both you and your child. Your teen is going through physical, emotional and cognitive changes. He or she is becoming an adult so you need to loosen the reins and allow your teen to take more control and responsibility for his or her life. He needs to be treated as an almost adult not merely as a child. Your role throughout this time is to be patient, understanding, accepting, supportive and flexible to his many moods and changes. When your child reaches the teenage years, it may seem that your problems have multiplied. The moods can change suddenly, the back talk may increase and the defiance could be high. During these situations, and many others, the worst thing is to react with immediate anger. This will only fuel it further. I’ve learnt that the best way to deal with anything is to hold the anger and become patient. Sometimes it’s hard but it needs to be held in check because anything coming from a place of anger may lead to regrettable consequences. So restrain your anger and pardon your child. And teach him or her in a kind and patient way, what is the right and the wrong way of behaving. Sometimes your teen doesn’t wholly understand her own self. So much is changing within and to her person that she doesn’t know what she’s doing. If she’s moody or being sarcastic or being contrary then try to understand the reason behind it. It could be hormones or trying to fit in. She could be copying a behaviour that she thinks will make her popular or she really doesn’t know what she wants. With patience for your teen, you will come to understand her. Talking and having a non-judgemental conversation instead of yelling or criticising in an accusing tone, to try and understand what’s going on will help her. This is why having open communications and maintaining it throughout your child’s growing years is so important. It will help you to understand what your teen is going through and empathise with her. Accept your teen as he is. You’ve taught him how to behave, directly or by omission, everything he knows since he was a child so it’s time to accept the person that he turned out to be. His tastes and interests are also developing and changing. No longer is he following you in doing the things that he used to like doing with you. Let him make decisions and contribute to family discussions. Accept that his decisions and choices might be different to yours. He is developing into his own person. Celebrate his uniqueness. On a personal note, I find this one the hardest. Each of my sons and I used to do things together. They would follow me around and hang onto my every words. I could take them anywhere and they wouldn’t mind where we go as long as we’re together. But since reaching adolescence, they developed their own interests. It’s about us parents accepting that this is a part of growing up and letting go so that our teens can develop and step into being their own person. While your teen is going through this uncertain period of her life she needs you to be there for her to offer support. Don’t back her into a corner by giving her an ultimatum. Don’t ever say, “I wash my hands of you’ as this means you’re giving up on her instead of giving support. 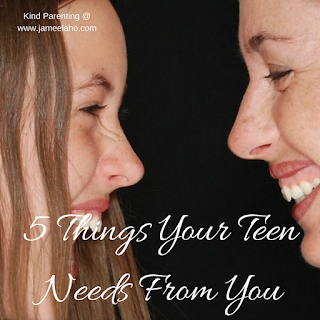 What you do is to let your teen spread her wings and take responsibility for her choices. Support her in them. Have confidence that she will make smart choices, if not then at least she can learn from them. When you have faith in your teen’s abilities and she knows she has your support then it will give her the confidence to make the right choices. If you are strict and controlling on your teen then it can push him into rebelliousness. Be not controlling of his every move and decisions as it can cause resentment and affect your relationship. Allow him the freedom and space to grow and develop. Being flexible also means that your own plans may have to change to take into account of your teens’. This includes your plans for your teen’s future like what profession he’ll enter into. You may have to give up all your dreams and hopes for his future if he strongly feels that it’s not for him. You might noticed that there’s a lot of overlapping between these five things that your teen needs from you. They are all interdependent. You can’t have one without the others. Pick one now that you need to work on for your teen and try to improve on it a bit every day.